當您將 Power BI Desktop 檔案發行至 Power BI 服務時，模型中的資料和您在 [報表] 檢視中建立的任何報表，都會發行至 Power BI 工作區。When you publish a Power BI Desktop file to the Power BI service, the data in the model and any reports you created in Report view are published to your Power BI workspace. 您會看到新的資料集具有相同名稱，以及在工作區導覽器中的所有報表。You’ll see a new dataset with the same name, and any reports in your Workspace navigator. 從 Power BI Desktop 發行，以及在 Power BI 中使用 [取得資料] 來連接及上傳 Power BI Desktop 檔案，兩者效果相同。Publishing from Power BI Desktop has the same effect as using Get Data in Power BI to connect to and upload a Power BI Desktop file. 對報表 Power BI 所做的任何變更，例如加入、刪除或變更報表中的視覺效果，都不會儲存回原始的 Power BI Desktop 檔案中。Any changes you make to the report in Power BI, for example, add, delete, or change visualizations in reports, will not be saved back to the original Power BI Desktop file. 在 Power BI Desktop12 > [檔案]> [發佈] > [發佈至 Power BI]，或在功能區上按一下 [發佈]。In Power BI Desktop > File > Publish > Publish to Power BI or click Publish on the ribbon. 登入 Power BI。Sign in to Power BI. 完成時，您會收到報表連結。When complete, you receive a link to your report. 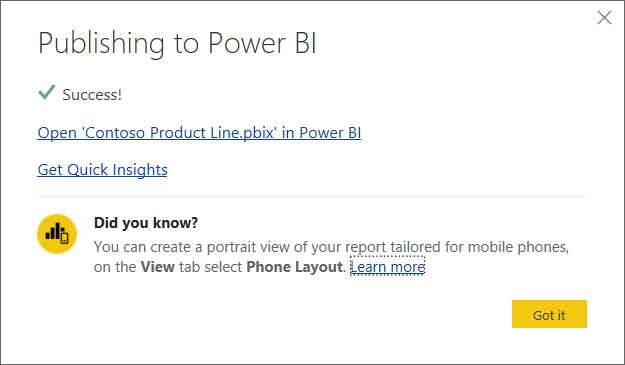 按一下該連結，在 Power BI 網站中開啟報表。Click the link to open the report in your Power BI site. 當您發行了 Power BI Desktop 檔案時，您在 Power BI Desktop 中建立的資料集和任何報表都會上傳至 Power BI 網站。When you publish a Power BI Desktop file, the dataset and any reports you created in Power BI Desktop are uploaded to your Power BI site. 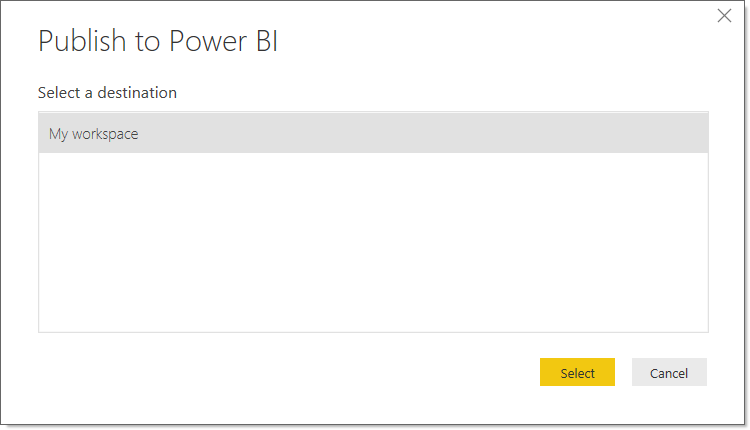 當您重新發行 Power BI Desktop 檔案時，會將 Power BI 網站中的資料集取代為 Power BI Desktop 檔案中更新過的資料集。When you re-publish your Power BI Desktop file, the dataset in your Power BI site will be replaced with the updated dataset from the Power BI Desktop file. 如果在 Power BI 已經有兩個或多個資料集名稱與 Power BI Desktop 檔案名稱相同，則發行可能會失敗。If you already have two or more datasets in Power BI with the same name as the Power BI Desktop file, publish could fail. 請確定在 Power BI 只有一個資料集具有相同名稱。Make sure you have only one dataset in Power BI with the same name. 您也可以重新命名此檔案並發佈，建立與檔案同名的新資料集。You can also rename the file and publish, creating a new dataset with same name as the file. 如果您重新命名或刪除資料行或量值，任何已存在於 Power BI 且具有該欄位的視覺效果都可能會無法使用。If you rename or delete a column or measure, any visualizations you already have in Power BI with that field could be broken. Power BI 會忽略現有資料行的某些格式變更。Power BI ignores some format changes of existing columns. 例如，如果您將資料行格式從 0.25 變更為 25%。For example, if you change a column’s format from 0.25 to 25%. 如果您已針對在 Power BI 中現有資料集設定重新整理排程，而您將新資料來源新增到檔案後重新發行，就必須在下次排定的重新整理之前，在 [管理資料來源] 中登入這些資源。If you have a refresh schedule configured for your existing dataset in Power BI and you add new data sources to your file and then re-publish, you’ll have to sign into them in Manage Data Sources prior to the next scheduled refresh.